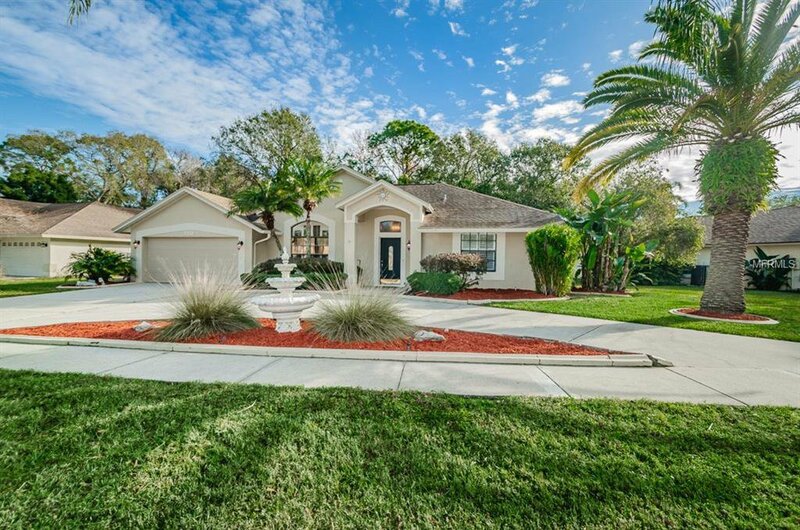 DON'T MISS THIS WELL-MAINTAINED POOL HOME LOCATED IN THE HIGHLY DESIRABLE COMMUNITY OF WOODFIELD. THIS STUNNING HOME OFFERS 4 BEDROOM, 2 BATH, 2 CAR GARAGE WITH OVER 2200 SQUARE FEET OF LIVING SPACE. KITCHEN IS SPACIOUS AND OFFERS PLENTY OF WOOD CABINETS WITH PULL OUTS, TWO CLOSET PANTRIES, STAINLESS STEEL APPLIANCES, CORIAN COUNTERTOPS, BREAKFAST BAR AND LARGE EAT-IN AREA. SOME OF THE HOME'S FINER FEATURES INCLUDE: ROOF (2012), PLANTATION SHUTTERS, CROWN MOULDING, LAMINATE WOOD FLOORING THROUGHOUT, UPGRADED FIXTURES, AND GARAGE IS INSULATED AND A/C FOR YOUR COMFORT. ENTERTAINING WILL BE A BREEZE IN THE POOL AND COVERED LANAI AREA. CONVENIENTLY LOCATED NEAR SHOPPING, RESTAURANTS, TOP-RATED SCHOOLS, PARKS, BEACHES, GOLF COURSES, MEDICAL FACILITIES, TAMPA AND ST. PETE/CLEARWATER AIRPORT, AND HISTORIC DOWNTOWN TARPON SPRINGS. MUST SEE TO APPRECIATE! SCHEDULE A SHOWING TODAY....THIS HOME WON'T LAST LONG! Listing courtesy of RE/MAX CHAMPIONS. Selling Office: COLDWELL BANKER RESIDENTIAL.